Information on summer fun at Lee Canyon, P!NK at T-Mobile, Candlebox and Cracker on Fremont Street, the Blue Angel at Neon Museum, a storyslam at Charleston Heights Arts Center and a new musical about Marilyn Monroe at Paris Las Vegas. 1. Lee Canyon opens for the summer season on May 25. Activities include scenic chairlift rides, an 18-hole disc golf course, a mini skateboard ramp, hiking, mountain biking, patio games and more. 2. Splash into Summer at Whitney Pool on May 25. There will be free barbecue, ice cream and more. The family-friendly movie starts at 8 p.m. Hosted by Las Vegas Metropolitan Police Department's Safety Through Outreach and Prevention Coalition. 3. The Punk Rock Bowling & Music Festival is happening this weekend in Downtown Las Vegas. Performances by Rise Against, At the Drive Inn, Against Me!, The Partisans, NOFX, The Marked Men, Larry and His Flask, Resistance 77, The Birth Defects, and Father Figures. There will also be pool parties, punk rock movie viewings, comedy shows and bowling, of course. 4. P!NK performs May 25 through 28 at T-Mobile Arena. The singer has sold more than 47 million albums worldwide, won 3 GRAMMY awards, a Brit Award, 7 MTV Video Music Awards, and more. 5. Rosati's Pizza on South Eastern Avenue is hosting its 2nd annual car show with lots of beautiful cars, pizza, chicken wings, beer specials and a free scoop of ice cream for kids from 6 to 9 p.m. May 25. 6. The 2018 Downtown Rocks summer concert series will kick off with performances by Candlebox and Cracker . Candlebox is celebrating its 25th anniversary. Their best known hits include "Change," "You," "Far Behind" and "Simple Lessons." Cracker is best known for its gold-selling 1993 album, Kerosene Hat. 7. The Neon Museum is hosting an exhibit titled "Blue Angel: Between Heaven and Earth" for a limited time in the NE10 Studio. The angel will be surrounded by signs frm the Neon Museum collection and Blue Angel-inspired images by multiple artists. Exhibit open to public from 1 to 4 p.m. Thursdays through Saturdays through July 6. 8. It's Fiesta Day at the Carlos J. Martinez & Dario J. Hall Family Pool at Gary Reese Freedom Park on North Mojave Road on May 26. There will be Latin music and refreshments. Admission is $4. 9. Desserts in the Desert will take place May 26 inside the Clark County Government Center Amphitheater. There will be an array of desserts, cocktails and whiskey pairing class. The event will take place during a Jazz in the Park concert. Diane Schuur is performing. Proceeds benefit The Gay and Lesbian Community Center and Nevada PEP. Future dates for Desserts int he Desert are June 2 and 16. 10. Charleston Heights Arts Center will host a storyslam on May 26. Members of the community will tell stories about their best/worst summer jobs. Moderated by Clark County Poet Laureate Vouge Robinson. $5 donation suggested for admittance. 11. The legendary Air Supply performs May 26-27 at The Orleans. The soft rock duo from Australia made their debut in 1976. They had 8 Top Ten hits in the U.S. in the early 1980s. 12. The 2nd annual Soulful Summer Nights concert at Craig Ranch Regional Park on May 27 will feature performances by Musiq Soulchild, Keyshia Cole, Job B and more. There will also be food trucks and beverages available for purchase. 13. "Marilyn! The New Musical" at Paris Las Vegas celebrates the life of Hollywood icon Marilyn Monroe from her early days as Norma Jeane to her rise to stardom. The musical stars Broadway actress and singer Ruby Lewis. Daily except Mondays. 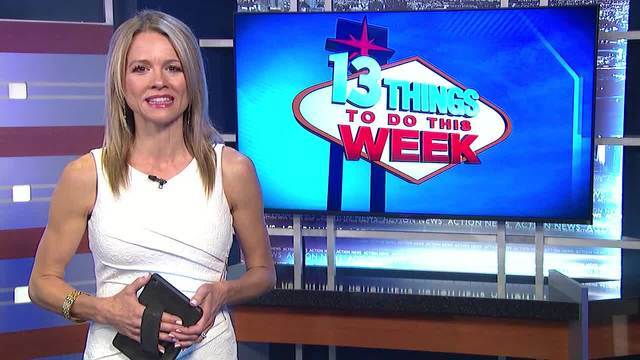 If you would like to submit an item for 13 Things, send an email with details to joyce.lupiani@ktnv.com.